February 2015 Cancer Horoscope forecasts that you need to concentrate on social skills to get things done. This is because majority of planets are in the Western sector of your natal chart. This is not the time to exert your independence. But you have to adapt yourself to situations and people. In February 2015 planets would have shifted to the upper half of your horoscope, and hence you have to pursue your targets with vigor and zeal. New ventures can be started during the second and third weeks. 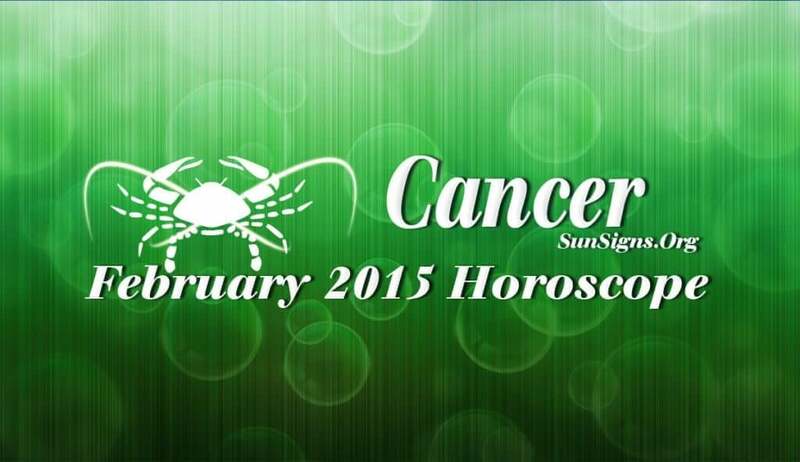 February 2015 will be a fabulous month for the Cancerians with many accomplishments and forward growth. The career prospects are very bright for the Crabs in February 2015, but you have to put in lot of effort to finish your targets. You will be recognized and rewarded amply during the month in your profession. If you are searching for a job or planning to start a new business, you will be successful. The Cancer February 2015 financial astrology predictions point to a profitable month. You will have enough money to clear old loans and you can expect money suddenly from unexpected sources. Love will be turbulent during the early part of the month for the Cancer zodiac sign in February 2015. During the last week current partnerships will progress and new alliances will occur. Love will be found amongst friends. This is also a good month to get pregnant. Your spouse and family members will support your financial targets. Money will be spent on children. This is also a good time to bond with your children and parents. The Cancer February 2015 horoscope foretells that your health is up to the mark and will improve as the month progresses. Stick to your normal routine of diet and fitness exercises. Trying out alternative home remedies for minor illnesses is also a good choice.